Kenwood's TK-3170 VHF handheld portable radios provide easy operation plus versatility and reliability in a compact yet rugged package. The TK-3170 is built to survive the hard knocks, drops and all weather environments of its users. It meets or exceeds the stringent I P54/55 dust and water intrusion standards and the MILSTD 810 C, D, E & F environmental standards including the demanding "driven rain" test. The TK-3170 offers convenient hands-free operation with a compatible headset. The TK-2170 internal VOX (voice-operated transmission) circuitry provides automatic PTT and a 10-level sensitivity adjustment for different ambient noise levels. Buy now. 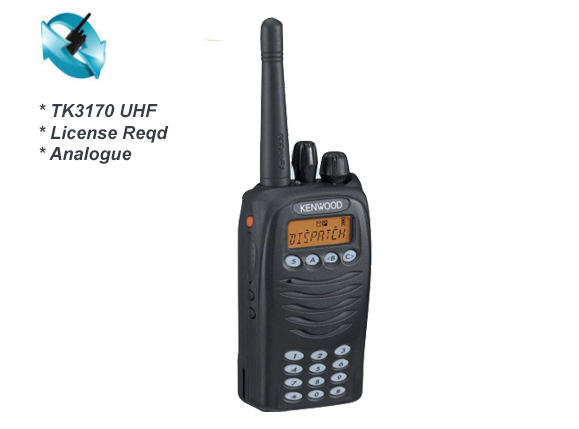 Information is below for more about these TK3170 radios, we sell all accessories . Don't forget to fill out the contact form for the best UK pricing. FleetSync®: PUSH TO TALK ID, SELCALL & EMERGENCY: Kenwood's FleetSync"' digital signalling system includes PTT ID digital ANI for instant radio call identification and Emergency status for personnel safety. FleetSync® also includes status messaging, selective calling and short/long text dispatch messaging features. Emergency Calling notifies a dispatcher of personnel in distress by activation of an orange colored emergency key. BATTERY STATUS INDICATOR ON BOARD: For extra convenience, a 4-step battery status indicator notifies the user immediately of the amount of charge remaining by visual indication (icons) or tone alert. EIGHT CHARACTER LCD DISPLAY: The backlit LCD with 8-character, 13 segment aliases and icons provides an easy-to-read channel, function and FleetSync"' messaging display day or night. 128 CHANNELS AND 128 ZONES: The convenient 128 channel/128 zone capability accommodates virtually any current or future capacity requirement for single or multiple site radio systems. ENHANCED KENWOOD AUDIO: The TK-3170 provides loud, clear audio even in noisy environments. COMPACT REFINED DESIGN: Compact enough to carry anywhere with ease, this smart new radio has a distinctively ergonomic form that's handy to hold and operate. QT/DQT, DTMF & 2-TONE SIGNALLING: In addition to FleetSync®, the TK-3170 includes industry standard signalling formats: QT/DQT, 2-Tone (encode/decode) can be utilized for talk groups, system access and selective calling. DTMF permits DTMF PTT ID, telephone interconnect operation, individual/group selective calling and remote radio disable/enable (remote stun). SCANNING: Multi-channel call monitoring can be customized for users with single/multi-zone scan and delete/add scan features. Priority Scan automatically checks a primary channel for activity while receiving a call on a non-priority channel. Convenience features such as Priority-channel Stop Tone, Temporary Delete, and Revert Channel Display facilitate user friendly operation and eliminate confusion. BATTERY SELECTION: The TK-3170 has a choice of two Lithium-Ion batteries KNB-55l. !KNB-57L as well as a NiMH battery KNB-56N for maximum flexibility. VOICE INVERSION SCRAMBLER INCLUDED: The built-in voice inversion scrambler provides basic protection against casual eavesdropping. EASY OPTIONS PORT (20-PIN): Kenwood's plug-in option port makes the compatible after-market board installation quick and simple. VOX READY OUT OF THE BOX: The TK-3170 offers convenient hands-free operation with a compatible headset. The TK-3170 internal VOX (voice-operated transmission) circuitry provides automatic PTT and a 10-level sensitivity adjustment for different ambient noise levels. *See PDF download for specifications.